Celebrate another year of you by hosting a birthday bash for the books -- and kick it off with an Evite invitation. Planning a sweet sixteen or turning 29 again? 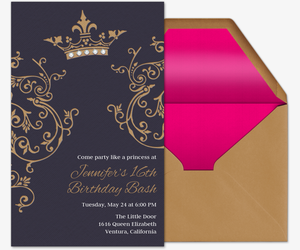 Our Birthday for Her invitation collection has designs for all ages -- teens and adults. Whether you’re marking the milestone with cupcakes or cocktails (or both! 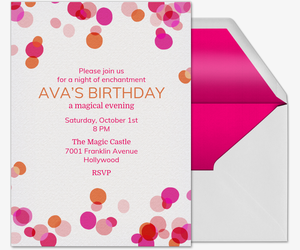 ), choose an invitation that inspires just the right amount of birthday spirit. Provide any additional information in the custom host message, like whether the party has a theme or dress code. Scheming up a surprise party? 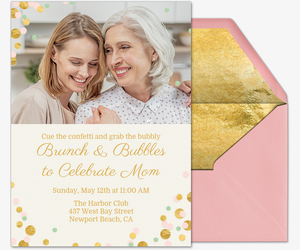 Keep it on the down low by communicating with guests directly on the digital invitation -- and leave no paper trails behind. Plus, our digital invites streamline the planning process and keep the guest list and details organized, so you can focus on the fun part. A celebration of life shouldn’t put a strain on your wallet. 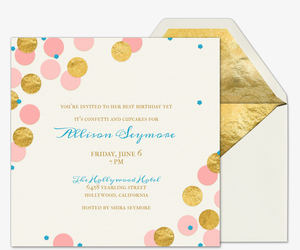 Celebrate on a budget by choosing from dozens of free birthday invitations. 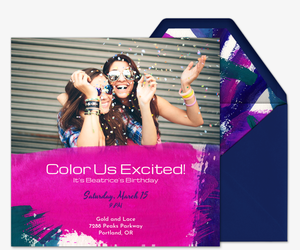 Whether you’re planning a blowout birthday bash or a low-key get-together, you can find a free design to match. Get guests excited with a cake or cocktail-themed invitation, or set the tone for an evening event with a string lights design. Don’t leave anyone out -- track down all your friends by sending the invitation’s shareable link via text or posting it across your social media network. 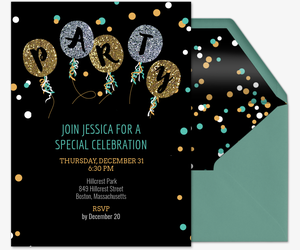 If you’re marking a monumental year, set the bar for your party high with one of our Premium invitations. 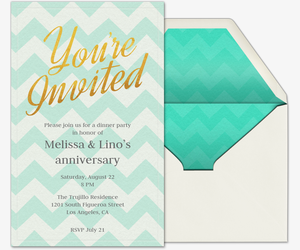 Evite’s ad-free Premium invitations mirror traditional printed invitations and come with matching envelopes with deluxe patterned liners and customizable stamps. Pricing is based on the size of your guest list -- for example, $12.99 for 15 guests, $24.99 for 50 guests and $49.99 for 750 guests. Set up for the surprise with our Premium “Shhh Can You Keep a Secret?” invitation, or send out our humorous “Don’t Ask” birthday cake invitation if you’re done counting candles. 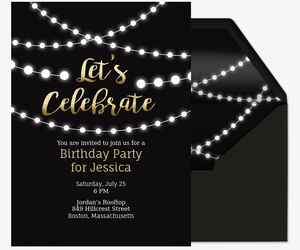 You can also upload a photo of the birthday girl or your own custom design to one of our upload-your-own or design-your-own invitation templates. Make the day memorable with birthday party ideas from ideas.evite.com. Check out our top tips on how to personalize a party, celebrate yourself on your special day, and put together a last-minute gathering. And what better way to celebrate yourself than with DIY decorations? Bring on the balloons with a DIY balloon wall backdrop, or try your hand at DIY tassel garlands and party cups. As for cake, it’s ice cream all the way -- be sure to check out our ice cream cake recipe. Then get more inspiration from real birthday parties thrown by birthday girls just like you, featuring themes from casino to beach. Planning the party for a friend? Top off the party with a personal present from our list of top gifts for her. Don’t forget the thank yous! Once the party is over, show your guests gratitude for making your day special, whether they came out to celebrate or dropped off a gift. Make it easy on yourself with Evite’s digital Thank You Cards.